This following is a guest-post from Fredrik M Sjoberg, a Postdoctoral Scholar at Columbia University (who is still disappointed about not being able to present these findings at APSA….). The paper on which this post is based is here. Why is it that voters in autocratic states report a higher confidence in the honesty of elections, compared to more competitive hybrid regimes? 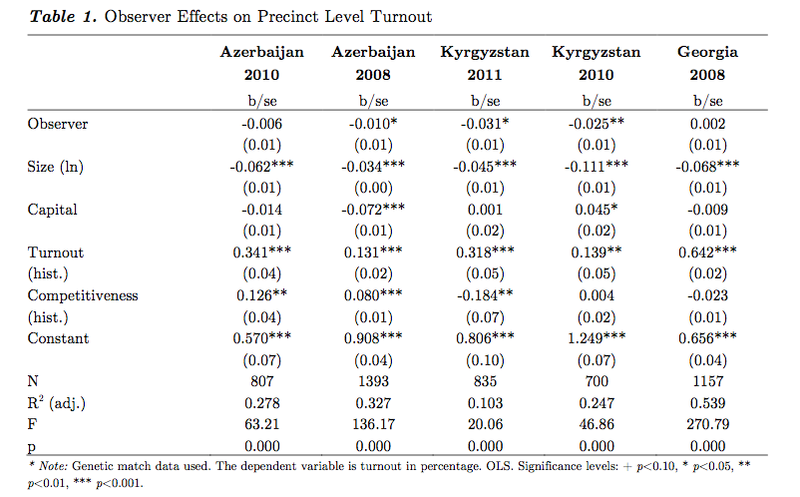 Five-year averages on the Gallup World Poll question about honesty of elections show that the proportion of people that respond affirmatively is 53% in Azerbaijan and Tajikistan, and 39 % in Kazakhstan – all solidly autocratic cases. In the more competitive regimes of Georgia, Ukraine, and Kyrgyzstan, the numbers are paradoxically lower, with 31%, 14%, and 23% respectively. Perhaps the explanation can be found in exposure to voter manipulation? In autocratic countries where elections can be rigged bureaucratically the voters are marginalized. In more competitive regimes where parties have to rely on voter manipulation voters need to be engaged directly. In a recent paper I illustrate the micro-dynamics of fraud with the help of field experiments in five separate elections in three different countries. For the sake of simplicity, we can separate out bureaucratic fraud, happening inside polling stations, from voter manipulation, happening outside. 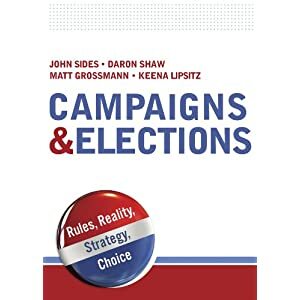 When faced with a fraud-reducing intervention, like election monitoring, parties as strategic actors can adapt and substitute one form of manipulation for another. When observed by international observers, spending on average less than one hour per polling station, the adaptation can take the form of temporarily suspending bureaucratic fraud. Domestic observers are tougher since they are often assigned to cover one polling station for the entire election day. In addition, domestic observers have more detailed knowledge about malpractices and the local context. Domestic observers, therefore, theoretically reduce bureaucratic fraud, but as a consequence might cause an increase in voter manipulation, a form of perverse empowerment of voters (which in turn might be driving the perceptions about the honesty of elections). Second, new fraud forensics techniques, in the form of last digit tests, are used to capture falsification of electoral returns. 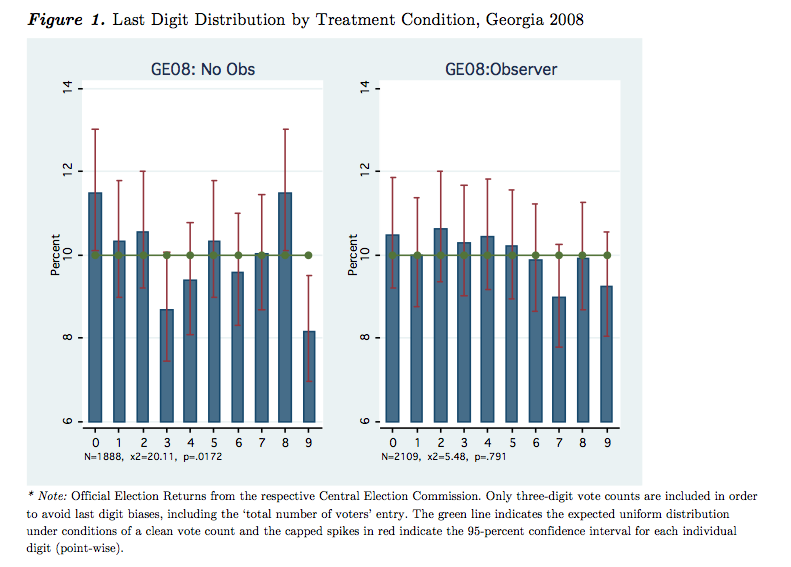 Also here, observers seem to reduce it as illustrated by the case of Georgia in 2008. 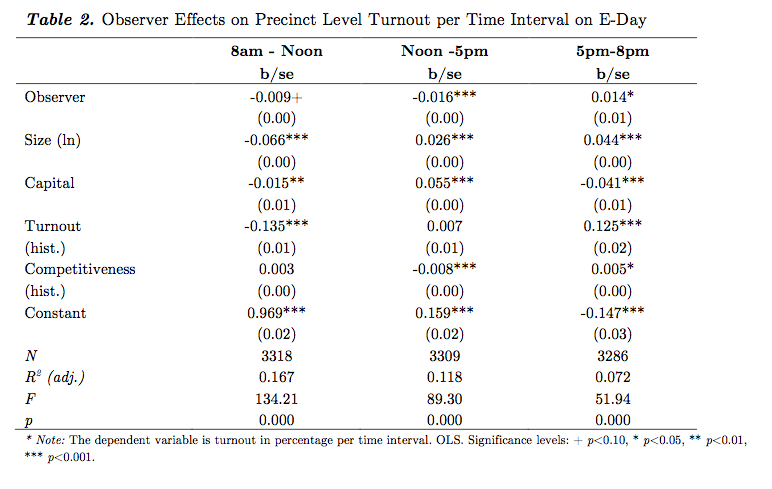 Finally, if parties respond to election observation by engaging voters more directly we should observe a negative turnout effect earlier in the day (when ballots are stuffed in non-observed locations), and a positive effect in the evening (when hitherto reluctant voters are brought out). As it happens, this is exactly what we see in the parliamentary elections in Georgia 2008.